In this portrait of family life, we are taken on a journey over many generations of this well-to-do family. We gather together in their dining room for meals, specials occasions, conversations and other situations-some funny, some touching, some hard to take. Through vignettes, six (or more) actors portray all of the characters in this family, as they come and go. It is at once touching and humorous. The Dining Room is a phenomenal play that should not be missed. 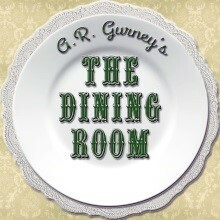 The Dining Room is presented by special arrangement with Dramatists Play Service, Inc., New York.